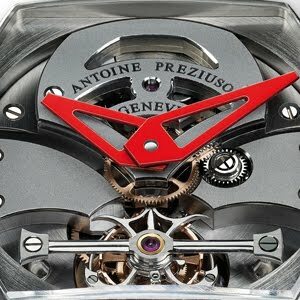 For several years now, Antoine Preziuso has made his Haute Horlogerie "Art of Tourbillon" collection a showcase for numerous unique creations that take this prestigious complication, a favourite for the independent watchmaker, as their focus. The Grand Tourbillon Sport is, without doubt, the most sporting timepiece to join this exclusive line. Its aerodynamic form suggests the contours of racing cars while its dazzling red javelin-shaped hands suggest speedometers. Its case, measuring 52 x 45 mm, is crafted from ChromeCobalt (Co-Cr), an exceptionally resistant, high-tech alloy. 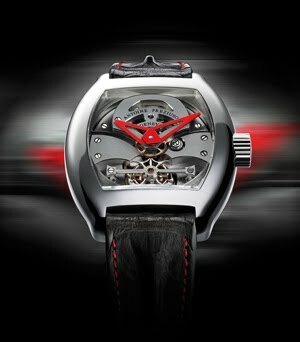 It contains the APG/28T tourbillon calibre. Antoine Preziuso further innovates with an original sales concept: his watches are only available from the brand in Geneva. You don't live in Switzerland? Not to worry: your flight in business class and two nights in a luxury hotel will be reserved for you when you purchase your watch.